Reader review by Panic Attack. A demon is after Andre Toulon's secret formula, but an irresponsible whiz kid brings the living puppets back to life to oppose the demon's totem dolls. I'm not really a Puppet Master fan or even watcher of the series. Puppets of all shapes and sizes kind of scare me in some way. You know, looking at those photos, I swear I seen some of those people or monsters before. The big one looks like a cross between Skeltor and the monster alien from Phantsmagoria 2. 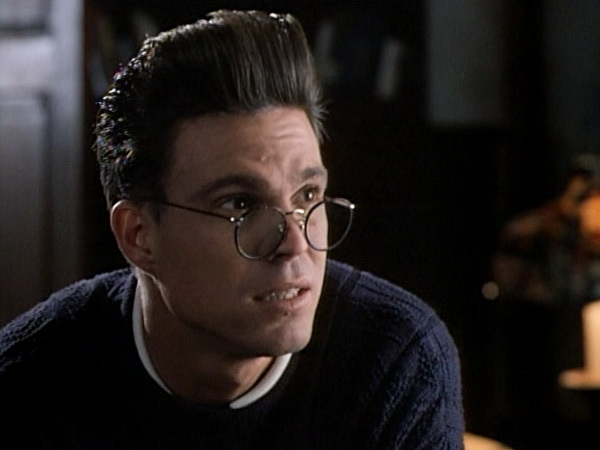 Is that Vanilla Ice with glasses? I remember actually watching this film way back when. What's funny is they had extras on the VHS (yes, on the VHS) with a short "Making of", and I think everyone involved was taking the film waaaaay more seriously than the material deserved. 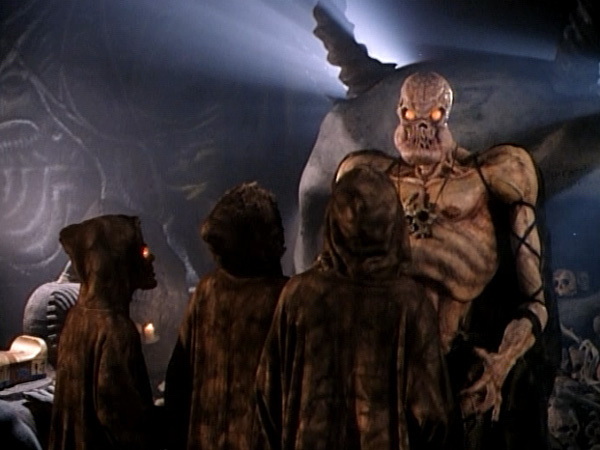 I remember of the main bad guy the designers were saying, "Yeah, the script was really vague about the monster, just saying that he was the ruler of the fifth dimension, so he had a lot of leeway as to how we were going to portray him." That's exactly what I thought when I saw him, and this picture is probably the one scene and angle that makes him look the most like Vanilla Ice. Actually, he looks more like Snow than Vanilla Ice. I recall seeing this and thinking "you must reanimate the decapitron" was the most hilarious line ever. My friends could not stop me from saying it constantly. I am amazed I suffered so few Puppet Master related injuries. Can someone explain the Quiet Riot reference? I don't see the straight-jacketed metal masked maniac anywhere. I remember watching this movie when I was a kid. We used to rent this from the video store down the street when my brother was going to babysit me. As a kid I used to be scared by this movie. Its funny now but back then it didn't take much to scare me. The puppet master movies were always a lot of fun. Even the newer ones are pretty good, I mean they are still low budget but they're still entertaining.